I just finished my new presentation for Inbound 16 on sales enablement and it’s growing importance in successful sales, demand and revenue generation strategies (you are coming, right?). The focus of my presentation is on how sales enablement is crucial to bridging the divide between sales and marketing. I kind of laugh when I hear people talking about sales and marketing alignment (and, yes, that means I laugh a lot these days). While alignment is certainly not a new issue, it’s prevalence has grown tremendously. It’s become so common, that while everybody agrees that it’s a worthy objective, very few have actually stopped to consider why it’s important. The answer is actually quite simple. It’s important (and frankly, it’s only important) if predictable and sustainable growth - what we call scaling growth - is an objective. So, it’s a worthy effort. However, as the goal of alignment becomes more popular, the approaches most companies take are less effective. The reason for this is that organizations have a tendency to focus on tactics, before they focus on strategy and structure. It’s the classic Stephen Covey, 7 Habits dilemma. You get so focused on getting from Boston to Miami as fast as possible that you never stop to realize that your destination is San Diego. Before you can have sales and marketing alignment, you must have the structure that supports it. There are three components required for that structure. Good market: Is the market you’re pursuing big enough, with the appropriate knowledge needed to understand and take advantage of your product in a way that can meet your short-, intermediate- and long-term objectives? To answer this question, you have be clear on what those objectives are. It’s not enough to say “I want to grow;” you must be specific about how much growth you want and when. Product/Service: Look beyond the commodity part, and determine if your value proposition and brand message are clear and powerful enough to resonate with the market you’ve defined. Note that as you grow, your product/service and value proposition will need to evolve to ensure you continue to meet the needs of your market. Satisfy: Can you be the best at something? Is there a problem you eliminate better than anyone else? Is that problem big enough and important enough to support your economics, and are there enough people with the problem and means to solve it to allow you to meet your growth objectives (and we’re back at good market). I’ve seen this show too many times. A small company grows because it does something very well. They delight their early customers, who tell other people and those people buy. They hustle and begin to have some success on the sales side. Their confidence grows and they feel ready to scale growth. But the problem is that they’ve relied on a very small segment of the market to fuel their growth; a market that had already defined their needs. As a result when they invest in demand generation and/or inbound marketing, their investments and efforts do little. A strong message challenges the customer, provides a point-of-view and defines not only the solution, but the problem as well. Further it does so in a succinct and clear manner. Here’s a great test. Write your company’s story (its message) that clearly communicates the why, what and how, and if you can’t do it in less than 300 words, keep at it until you can. Do you have a defined sales process? One that is followed by every person involved in your organization? Do you have the metrics to communicate how well your sales process is truly working? Can you tell the difference between how the actions of your salespeople impact a sale taking place vs. just being in the right place at the right time? I could go on, but if you don’t answer each of these with an emphatic “Yes!” then you need to work on your sales process. The biggest challenge facing selling organizations today is that far, far too many of them still drive their decision making by gut instinct, instead of making data-backed decisions. I’ve always enjoyed the analogies between selling and sports. One only need look at the investments sports franchises are making into advanced analytics to realize that selling is still too often operating in the dark ages. 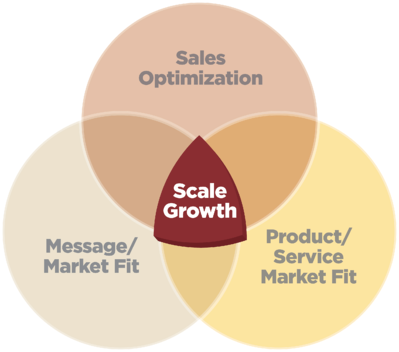 When product/market fit is combined with message/market fit and sales optimization, growth stops being mysterious and previously unseen opportunities become clear. Very few companies will actually spend the time to build the solid structure I outline here, so remember that if you’re one of them, you’ll have a huge advantage.